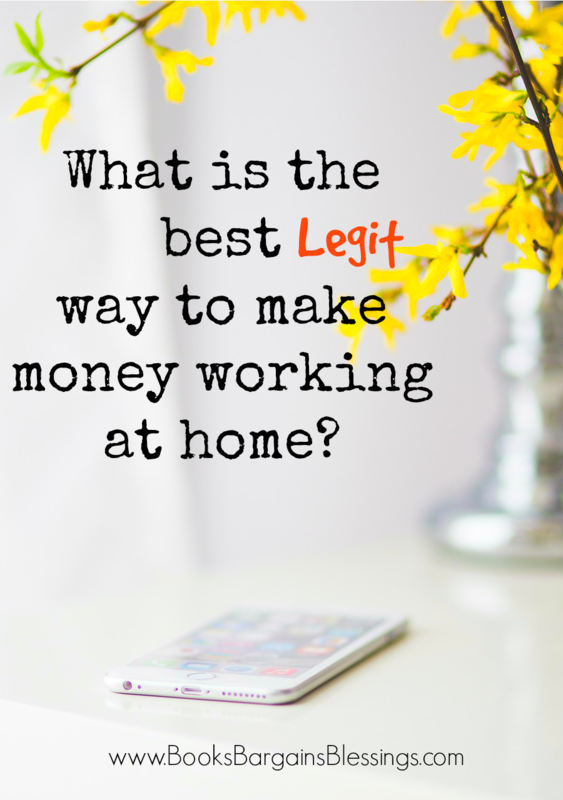 Books, Bargains, Blessings: What is the best way to make money from home that is legit? What is the best way to make money from home that is legit? I hear the questions all the time. Is it hard to sell on eBay? Is it better to open an Etsy or Amazon store? Should I sell a multi-level marketing product? Do people really win contests or sweepstakes? How can I make money from a blog? Each one of these questions could be the focus of a blog post itself. But here are some quick answers from me. Selling on eBay can be time consuming, and with all these things there is a learning curve. However, in my opinion, it's the best way to start making some extra money. Instead of going out and buying inventory, sell some of the things you have around your house. It can be confusing the first few times you list on eBay, but I started selling in 1998, and I had to learn everything on my own. I have a number of blog posts about selling on eBay, there are lots of good instructions on the eBay site itself, and there are also a huge number of books available for the eBay newbie. Who I recommend this line of income to: Nearly everyone. It's the easiest way to bring in some quick cash of the above listed ways to make money. Personally, I wouldn't recommend getting into Amazon or Bonanza until you get your feet wet learning on eBay. There are selling limits, so you can't expect to open a store today and sell $10,000 of items in your first month. They want to know you are a reputable seller before they raise limits. I've been selling on eBay for 18 years, and even I have limits on my account, but they are ones that I will not reach, and if I do, I can always call them and request them being raised. I signed up to sell Paparazzi $5 Jewelry about a year ago, but I have barely made any money over what I had invested. There are a number of companies out there, and I chose Paparazzi because of the low cost of fun items but it didn't work out for me. Also, I have allergies so essential oils and Scentsy were out, and it seems Pampered Chef and Thirty-One consultants saturate my area. I had difficulty getting parties scheduled, and when I went to shows I kept thinking "I wish I had stayed home and listed on eBay." I realize there are several things stacked against me, and I would say this could be an option for some people, but as it turned out most of my sales were made online. I'm still a consultant, but just trying to sell only online. Who I recommend this line of income to: Those with a HUGE social network locally. I have a lot of Facebook friends, but the majority of my friends are spread out, literally all over the world. I would also recommend this to someone who can host parties in their home. The better income is made from your downline, so you have to be willing to recruit people. No matter how cute or functional the product is, you have to find people who want to buy it, and unless your social network is large, that might be difficult. The sales were not there for me at shows in the rural area I live in, so take that into consideration as well if you wish to do shows. Do people really win contests and sweepstakes? Yes, people really win contests and sweepstakes and I have a number of blog posts about how to win, but I don't recommend this as a source of income. It should be a hobby. I won $18,000 in cash one year (multiple sweepstakes) but that is the exception rather than the rule. It is hard to pay bills with the books you win. It's not easy to keep the lights on when the mail brings you a coupon for a candy bar. There's a lot of debate if it's okay to sell wins or not. I prefer not to -- I'd rather give something I win that I can't use to someone or a place that could use it. But I certainly would NOT recommend entering to win to sell. Besides being random, you still have the hassle of selling, and it's so easy to find valuable things at auctions, garage sales, etc., that you can flip on eBay there is no need to add in the entering of contests and sweepstakes. I enter for items I actually have a use for. Who do I recommend this line of "income" to: I recommend it only if you like mail, and aren't really needing extra income, but want some of the extras in life and don't have money for them and are willing to wait -- sometimes years for something extra special like a trip to a tropical location -- and realize you will still have to put in work to win it, even if it is entering a lot of forms with your name and address. How can I make money from a blog? Sorry to burst your bubble, but most bloggers aren't making the amount you have read online that some bloggers make. It takes a lot of work and dedication -- and you might not see any profit for a few years. Yes, it is possible to make money from a blog, but there is a lot more involved than just sitting down, writing a post, and then coming back when you feel like it and writing another post. There is learning how websites work, writing, re-writing, social media sharing even on sites you don't really enjoy using -- and being careful not to spend too much time on the sites you do enjoy. There is the constant learning of new tricks in the blogging world. I think video is soon going to take the blogging world by storm, and that's something I haven't even started learning to use to my advantage -- yet. Yet, if your readers love you, it is possible to make money by things such as sponsored posts, affiliate links, and writing your own books. If you are interested in this, I highly recommend Inspired Bloggers University for electronic courses on pretty much everything blogging. At first you will likely spend more money than you make, and you have to persevere even during rough times. Who do I recommend this line of income to: Someone who loves to write, and can talk forever about a certain topic. Who do I recommend this line of income to: Those who love to write and would do so even if they weren't making money -- because that will likely be what will happen in the beginning. Someone who eventually wants to work at home but is in a financial position where the extra income isn't needed right now. Someone who loves to be on the computer. I don't mean to discourage you, but it takes preparation and time to be able to make money on a regular basis. Some of these ideas take longer than others to implement. If you need money right away, getting a part time job on top of your full time one might be the best option, or selling a few items on eBay. But if you are thinking for down the road, this is a quick overview to see what might work best for you and your situation. 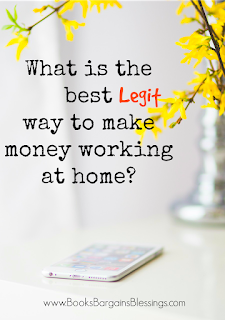 I'd love to hear other ways that you make money at home. Just leave a comment telling me about it. 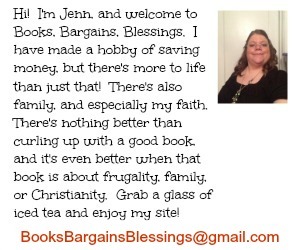 Also, I'd love for you to sign up for my e-mail newsletter so you don't miss anything here at Books, Bargains, Blessings. I talk about ways to save and make money because pinching pennies shouldn't mean pinching happiness. Great post, especially about the blogging. Now that I'm actually making some money, everyone I know wants to start a blog. They don't realize how much work I've put into it and how long it actually took to gain a little success. It's totally worth it but definitely not a get rich quick plan...LOL! Thanks so much for sharing with us at Share The Wealth Sunday! Thanks for stopping by. It sure isn't a get rick quick plan, is it? I started blogging about six years ago and I'm still making "hobby money" from it. Hope that changes in the future, but still not making enough to make it worth my time. But I keep trying!